This article originally appeared in the Progress Edition of the Garden City Telegram. Click on this link to access the article on the Telegram’s website. Special Note: Central Care Cancer Center is a partner with St. Catherine Hospital and Centura Health in providing oncology services at Heartland Cancer Center, in Garden City. 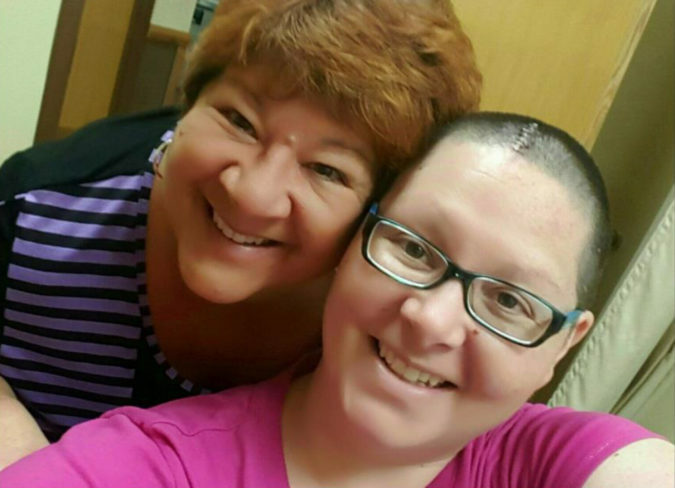 For Marcie Harris Charles, 60, and her daughter, Megan Charles Kramer, 37, receiving treatment for their very different breast cancers so close to home has made a huge impact on their families, as well as themselves. Charles, who lives in Dodge City, and Kramer, who hails from Cimarron, began the breast cancer battles in 2010, when Kramer was diagnosed with inflammatory breast cancer (IBC) — a rare and difficult breast cancer to treat due to its sheer aggressive nature to spread throughout the body. It occurs when the cancer cells block lymph vessels in the skin of the breast, making it appear bruised and swollen because of the reddish purple color. At Kramer’s checkup in March 2012, Dr. James Moffitt, her family practice physician in Dodge City, noticed a lump on her neck. After the usual battery of tests showed new cancer growth, Kramer prepared to go back to Wichita for further testing. But her oncologist there had retired, so the decision was made to go to MD Anderson Cancer Center in Houston, where she began a three-year-long trial that would take her well into 2015. On Christmas Eve 2016, Kramer came home from Phoenix. By now, cancer had spread to her brain. In January 2017, after consults and more tests, Charles and Kramer sat down with family friend Heather Wright-Renick, BSN, RN, CN-BN, who is a certified nurse navigator and director of The Breast Center at St. Catherine Hospital in Garden City and who also lives in Cimarron. 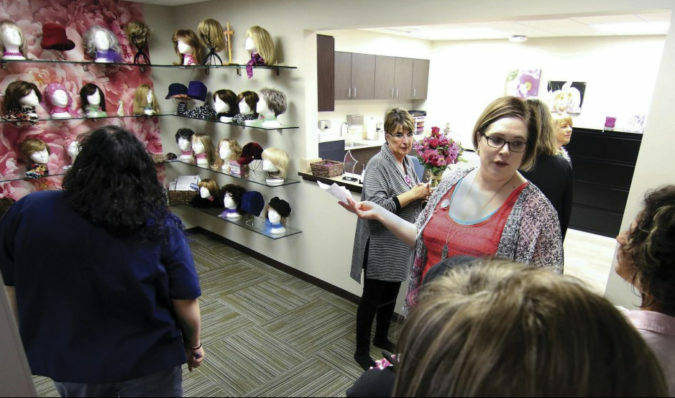 In her usual candor, Wright-Renick, herself a breast cancer survivor, asked when they were going to stop traveling and receive treatment at St. Catherine’s Heartland Cancer Center. While the cancer center first opened in 1997, expansion in 2016 greatly enhanced the cancer treatment services the center was able to provide for the region. According to St. Catherine’s website, the center features diagnostic PET Scan services, a dual energy linear accelerator and a treatment planning system utilizing the latest technology to aid in defining treatment areas while avoiding harm to at-risk organs. 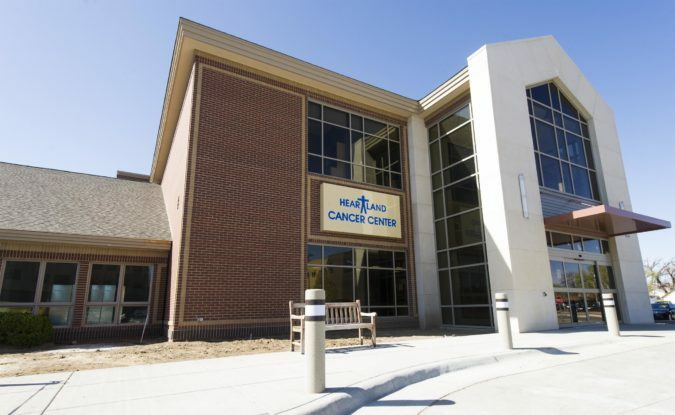 With the expansion, Heartland was able to acquire a Linear Accelerator, or TrueBeam, which can image tumors with high precision and deliver high energy treatment in a way that minimizes the amount of radiation delivered to healthy tissue. In addition, Heartland offers the latest in chemotherapy and radiation therapy to improve tumor control, reduce side effects due to better organ visualization, and enhance treatment techniques for optimal outcomes. St. Catherine also has partnered with the Midwest Cancer Alliance through the University of Kansas to increase access to the latest cancer treatments through a variety of clinical trials. After providing care and support for her daughter’s ongoing treatment and her family since 2010, Charles found herself being suddenly moved from caregiver to patient. On August 30, 2017, she found herself at the end of her every four months breast follow-up appointment with a diagnosis of invasive ductile carcinoma. Toumeh is both Charles’ and Kramer’s oncologist. Before coming to Heartland, Charles’ primary care physician in Dodge City ordered a diagnostic mammogram, skipping the usual screening mammogram. That was followed by two ultrasounds, two additional breast sonograms, bloodwork, X-rays and much lab work. But according to Charles, Heartland compared to other cancer centers she and her daughter have gone to, and she says Heartland always puts the patient and their family first. It has helped ease the burden of her caregiver husband Marc, who is chauffeur, chef and comforter for both his wife and daughter. She explained that in their situation, with both mother and daughter as patients, both immediate and extended family members stepped up, including Kramer’s husband, Cory (who was also holding down a full-time job) and his parents, Jim and Jean Kramer, also of Cimarron, who made sure their daughter-in-law got to appointments and that the grandkids stayed connected.